Those sharp new teeth mean your kitten has probably reached puberty. A kitten will start to cut his adult teeth between 3 and 6 months of age. By about 8 months of age, the cat will have all his permanent teeth. It's important that you keep your cat's teeth clean from an early age to prevent dental disease in your furry buddy. Your little kitten is born without teeth. His first set of baby teeth or milk teeth come in when he's about 4 weeks old. He'll have 26 of these teeth, including his incisors, canines and premolars. Your little one's baby teeth will last until he reaches about 3 months old, when he'll start to lose them and cut his new ones. His second set of teeth is permanent and will last the rest of his life. Altogether, there are 30 adult teeth, including four shiny new molars that he didn't have as a baby. The adult teething process lasts around three months; by the time your little one is between 6 and 7 months old, all of his new teeth will be in, according to the Cornell University School of Veterinary Medicine website. During your kitty's teething period, you'll probably notice him chewing on pretty much everything within reach. As he cuts his new teeth, he'll experience pain and swelling in his gums, leading him to relieve the discomfort through chewing. This can be dangerous if he gnaws on something like an electrical cord or a poisonous plant. To prevent such issues, cat-proof your home. Remove anything potentially dangerous and chew-worthy from within reach of your kitty; provide him with lots of toys he can safely teeth on. You can find toys in pet supply stores that are specifically for teething kittens. These toys are made of soft rubber or plastic so your kitty can comfortably gnaw on them, according to the VetInfo website. 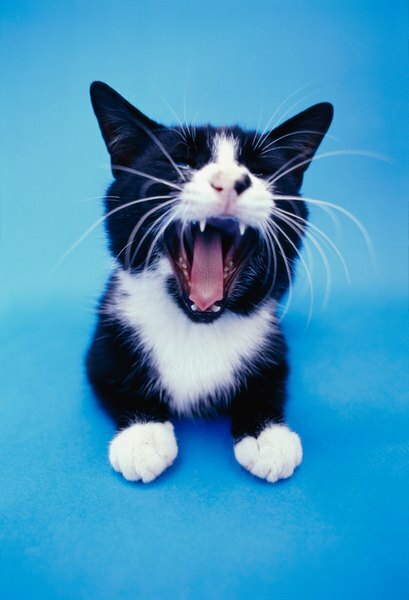 While your kitten is teething, it's normal for him to have a bit of bad breath. As his adult teeth cut through, the gums swell and bacteria tend to collect along the gum line, leading to stinky breath, according to Vetstreet. This inflammation usually lasts around four to six weeks, according to the Feline Advisory Bureau. During this time, you might notice your kitty is a little irritable from the pain. You can soak a wash cloth in water and freeze it for your kitten to chew on. The cold will help dull the pain. You may want to soften his regular dry food so he doesn't experience pain while eating. Switching to a canned soft food outright might upset the kitten's stomach. During the teething process, have your vet look at your little buddy's teeth and gums to check for issues. Sometimes baby teeth need to be pulled to make way for adult teeth and to prevent crowding or bite problems later in life. Your vet can advise you how to care for your little one's teeth. Once your kitty reaches around 8 months old and has all of his teeth, gum inflammation should have subsided. At this point, you can start brushing his teeth daily with a kitty toothbrush and toothpaste to keep them in tip-top shape. Have your vet check your furry buddy's teeth annually to see when a professional cleaning may be needed. With proper care, your kitty's teeth will stay strong and last her lifetime. Purina: When Do Kittens Lose Their Baby Teeth? PetPlace.com: How Old Is This Kitten? Vetstreet: My Pet Has Bad Breath -- What's Happening to Cause It? Is It Normal for Kittens to Bleed when They Lose Their Teeth? How Many Teeth Do Kittens Have? Do Cats Get Adult Teeth?